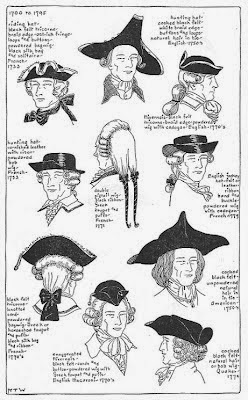 There were a number of opportunities for hatters in the early Republic, such as twenty-three year old Byron Greenough, who apparently learned the trade in Haverhill, Massachusetts. He may have apprenticed to the town’s best known hatter, Jonathan Webster, before striking out on his own. He settled in Portland, Maine in 1821. 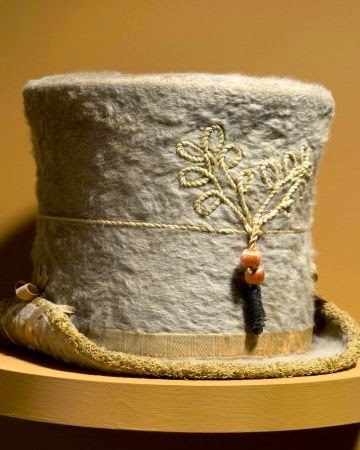 From the textile collection at Historic Deerfield, this especially handsome, striking bleached beaver fur tall hat, with matching grosgrain ribbon, dates to1825-1835. Completed after he arrived in Portland, the condition is excellent. Greenough labeled his hats. His business grew rapidly to include not only retail hats, but also boots and shoes. A successful businessman, he was able to erect a brick flatiron building at the head of Free Street in Portland. Last year (2013/14) Historic Deerfield had on exhibit this fabulous woman’s bleached beaver fur riding hat, early 19th century.